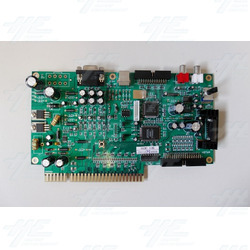 This is a generic Sega, Namco and Taito I/O board with built-in Amplifier that is suitable for Naomi I, Naomi II, Namco 246 System, 256 System, Taito Type X and Taito Type X2 motherboard. This allows you to connect late model arcade game boards into standard jamma cabinets. Please note: I/O board is brand new. This is a generic Sega, Namco and Taito I/O board with built-in Amplifier that is suitable for Naomi I, Naomi II, Namco 246 System, 256 System, Taito Type X and Taito Type X2 motherboard. This allows you to connect late model arcade game boards into standard jamma cabinets. Please note: I/O board is brand new.